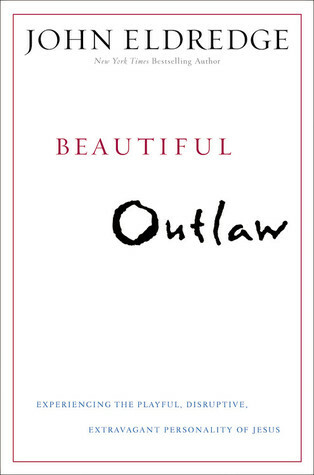 In Beautiful Outlaw, John Eldredge removes the religious varnish to help readers discover stunning new insights into the humanity of Jesus. He was accused of breaking the law, keeping bad company, heaving drinking. Of being the devil himself. He was so compelling and dangerous they had to kill him. But others loved him passionately. He had a sense of humor. His generosity was scandalous. his anger made enemies tremble. He'd say the most outrageous things. He was definitely not the Jesus of the stained glass. Didn't find this one on my own - thank goodness for friends who love to read :) - but so glad I read it. I'm probably going to buy my own copy so that I can highlight the whole thing! And, wait for it, it's a nonfiction title. That's not Steampunk related. I'm really stretching my reading muscles this year. This is a book about Jesus. Not the Jesus we've created through religion, the man with the flowing hair, long robe, and serene demeanor often seen in art. This is a book about Jesus and his humanity. John Eldredge paints a different picture of the Savior. A picture of a man who is funny, and cunning, and fierce, and compassionate, and relatable thousands of years after he rose again. And it's a book about learning to love Him and meet him in that humanness. Through stories, both personal and biblical, Eldredge reintroduces the reader to Jesus and encourages us to not only meet him in the Gospel but to look past the box that religion puts him in. Jesus was man who could have triumphantly sounded his return with fanfare and legions of angels after the cross, but instead He stands on a shore watching his disciples fish, meeting them again where it all began. He is happy and loving and passionate, and I can't wait to spend time with him in the Word. Loved this book. There's no condemnation or judgement from Eldredge. There's only a prayer that the reader opens his or her heart to the true knowledge. "An intimate encounter with jesus is the most transforming experience of human existence. To know him as he is, is to come home."